Citing energy efficiency and durability, industry has put LED lights on a pedestal. But is it really time to bid adieu to CFL and the humble tubelight? “Lighting big common areas in apartment complexes is draining us dry, but the offer from Philips to switch from compact fluorescent lamps (CFLs) and tubelights (linear fluorescent tubes) to light-emitting diode (LED) lights seems good,” says Amit Jain, director general of Federation of Apartment Owners Association in Gurgaon. The electronics company is offering its highly efficient range of LEDs at 30 per cent down payment and EMIs spread over the next two years, says Jain. “The market is abuzz that LED lights perform better than CFLs,” he adds. LED lights have been touted as the next big thing in artificial lighting market. They have the potential to surpass conventional lighting equipment in terms of energy efficiency and lifespan, says the industry. LED lights might be energy efficient but they are not good for the pocket. They are 10 and 20 times dearer than CFLs and tubelights, respectively. It is a luxury product for niche residential and commercial projects, says Digambar Singh, general manager (central design team) at Emaar-MGF, a leading real estate developer in the country. LED lights consume less power while an incandescent bulb saps power by kilos. He adds, “Even though LED lights require high initial investments, they pay off well in the long run.” The industry assures that within few years as technology matures and dem and and competition increases the cost of LED will be comparable to CFL. In the eighties, the industry made a technological advancement by introducing CFLs. They were 300 per cent more energy efficient than incandescent bulbs; the figure has improved to 400 per cent now. 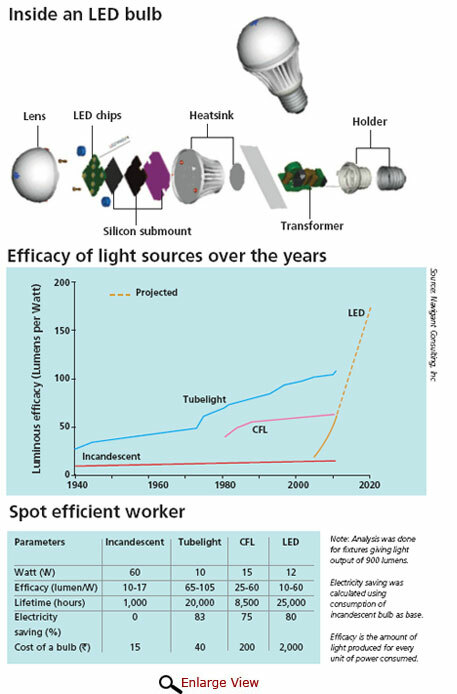 The efficiency graph is not the same for LED lights, introduced a few years ago. They are just five per cent more energy efficient than CFLs, according to the 2012 report by the US department of energy. But this report also predicts that by 2015 LED technology could become 300 per cent more efficient than CFL. Why then is the market filled with claims that LEDs are three times better than CFLs? Considering that the claims are based on their lifetime the buzz is not completely untrue. It is said that LEDs have a lifespan of 25,000 hours compared to CFLs’ 8,000 hours. But LEDs have not been used in the real world for 25,000 hours, so the numbers are mere speculations. Low-end LED products, especially those made in China, are bound to flood the market, but they will surely not last 25,000 hours, says Deepak Chaugule, interior designer in Pune. CFLs, meanwhile, are eight times longer lasting than incandescent bulbs. Therefore the improvement with LED lights is not so drastic. LED fixtures might be promoted as the way ahead, but they come with problems. For instance, an LED bulb is difficult to replace as it is available in panels. LEDs demand more controlled conditions and the lifetime of fixtures depends upon the source of energy supply. “Even a nominal voltage fluctuation can damage LEDs, whereas ordinary lights have more tolerance,” says Singh. Another problem with LED lights is the amount of heat they produce. Lobby says LED lights produce less heat compared to tubelights. That is not the case. Although LED chips, which work on DC current, generate negligible amount of heat, each light fixture has a transformer which converts the regular 120 volt AC current to 12 volt or lesser DC current. This conversion produces considerable amount of heat which is dissipated using heat sinks, adding equal if not more heat to the room as a tubelight. The humble tubelight might be at the bottom of the lighting technology hierarchy but it beats both CFLs and LEDs at most levels. Not only is it cheaper but also almost twice as efficient as CFL and LED fixtures. With a proven lifespan of 20,000 to 30,000 hours, tubelight is the best lighting option at our disposal today, says a 2008-09 study by the US Department of Energy. Switching from incandescent to CFL, LED lights or tubelights is a good idea from the perspective of saving energy. But market dynamics has turned this into a battle of LED against CFL and tubelight. LEDs have great potential but they need more time to mature and develop. Till then hold on to the seasoned tubelights. Even if the cheaper option, the limited application of tubelight makes it of lower preference. It can be easily put in rooms, basements, coves etc. But other places one has to go for CFLs or incandescent bulbs. Humidity kills tubelights really fast. Plus there is the problem of insects inside the tubes. I totally agree with your point of view that there are places where cumbersome size of T8 tubelights makes it difficult to use. Even the article doesn't recommend tubelights for all kind of purposes. Point made is that when it comes to general lighting there is no competition to tubelights. And market is bullish on replacing tubelights with LED ones even in this area, which seems not justified at current state of affairs. Humidity does effect tubelights, but that is normally confined to delayed on-set of lights, due to condensation at the tube surface. But it hardly has any effect on its efficiency or life span. In fact after the initial hiccup of maximum 5 mins, the tubelight functions as usual. This problem is there with CFLs too as they age. LEDs haven't been in real humid conditions so only time will tell how they behave, but one thing for sure LEDs are sensitive to humidity as well. So there is no clear winner for bathroom lighting. As for the issue of tubelights dying fast in humid environment, case can be made against the metal pin and holder which catch rust and in your words 'kills' tubelight. But this problem is not exclusive to tubelights, as humidity leads to rusting of all types of pins and holders, irrespective of their typology. 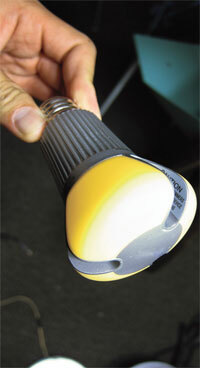 LEDs, CFL, incandescent or even halogen fixtures all have metallic pins only. But now weather-proof versions are easily available in market. I don't quite understand the insect bit though. I've never seen insects inside the tube, as tube is suppose to be perfectly sealed to make the tubelights and CFL work. If there are insects inside the tube then surely its a damaged fixture. And if you are referring insects being attracted to light by tubelights in night, well that will happen to any sort of light even candle light. Other possibility can be that you are referring to insects getting trapped inside the casing of the light fixture. Even this is a universal problem, independent of light fixture of technology. This is a good analysis. I wanted to make the point that essentially a Tube light or FTL is a distributed source of light ( Cylindrical and long) where as a CFL or LED is more of a pointed source of light. Hence even from a functionality aspect ( reading of news paper or a book ) under artificial light, a FTL should be preferred to a CFL or LED. Any campaign to replace the "inefficient" Tube light with an "efficient CFL" or an "efficient LED" needs to be checked. I also wanted to point out that while using a tubelight an energy efficient option is to use electronic ballast ( of reputed make) than a ordinary copper choke. Would like to see a similar comparison for public street lighting and road lighting, especially between HPSV lamps, HPMV lamps, MH lamps, Magnetic Induction lamps and LEDs. I agree with your point of view. Especially with slimmer and more efficient T5 tubelights which are there in market even task-lighting as you say can be easily achieved. But for more targeted spot lighting requirements other technologies are better. Moreover, with warm colour tubelights in the market, the argument about quality of light is also loosing ground against tubelights. We are already looking into the street-lighting and will soon come out with similar analysis. Great article and exhaustive coverage of the LED mania/phobia. Let me start with the shortcomings here. The fact that technologically a tube light and CFL are both based on fluorescence while LED's are based on circuits should take the battle between them to a domain of physics vs electronics where currently the efficiency and luminosity of the former technology is definitely greater. On the other hand, Computers & Mobiles have already proved to us how quickly science progresses when it comes to electronics and circuits especially. Also, in my opinion the viability of LEDs is also a major call which would require some major backend calculations. As for the pollution argument, needs more research as neither of them have a proper disposal policy which works in place in india so we are talking about choosing lesser evils indeed. Anyways a good read. I completely agree with everything you have raised. I have not tried to discredit LEDs or their potential, it is to clear the air about the misleading marketing of the current stock of products, which are not even close to projected performance figures. USEPA report says LED may become by 2015 the best lighting technology, I say the same lets wait till it matures to that level before shelling out those hard earned big bucks. It is 3 or 4 years too early to jump on the LED bandwagon and abandon others. It is interesting to read about LED mania. I think though the rural and small town population may not afford to switch to LED, the sheer amount of lighting energy being consumed in our ever growing cities does call for adopting this technology. Until a couple of years ago, I was saying the same thing--that tubelights are more efficient in lumens/watt than LEDs; and they cost a lot less to boot! That, however, is changing rapidly as economies of scale combine with advances in research. I think LEDs are poised for a leap into the mainstream and this will happen when a critical point is breached in their initial cost. Until then, the humble tubelight will still keep going strong. 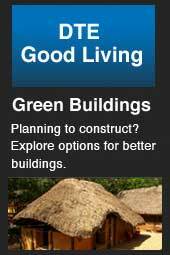 When designing buildings, I've started recommending both types depending on the application and on the clients preferences--some people harbour an unreasonable and inexplicable aversion to tubelights. I am happy to note that finally realization has dawned on the negative efficiency of LED s and CFL s . Yes they are technologically superior. BUT inherently till they are complemented with proper power supply in tune with their abilities it would be fair to assume they are not either cost effective options or energy saving options. They are exorbitantly costly. No proven record of durability. Till we get a Direct Current application the transformers and adapters will guzzle energy and give out heat. And disposal-ability is dangerous. very few municipalities are equipped to deal with this dangerous waste. Again the commercial world rules through marketing media. It is commendable that you give your clients option to choose. What we have noticed is people's aversion to tubelights has more to do with the colour of the light than anything else. Nowadays with warm-white and yellow colour lights in T5 tubelights even this block can be removed. Nice to hear from you and thank you for emphasizing on a point which I did mention but didn't stress upon in the article. All these new technologies which claim extreme efficiency run on Direct Current(DC), which is not the type of electricity which the normal grid supplies to buildings. Thus to convert our regular Alternating Current (AC) supply to DC we are dependent upon transformers, and these transformers have not improved much and are still very energy inefficient and generates heat. In short your bulb has become energy efficient but to run that bulb you are dependent upon a very inefficient technology which sort of nullifies all the gains. And this fact is conveniently left out of the marketing leaflets by the industry, which relies heavily upon planned obsolescence to sustain their profits. But this is a highly wasteful and resource insensitive practice. We need to start seeing through such marketing practices. You're right about the colour part Avikal & I usually recommend the warm-white but (and herein lies the problem) the aversion is often so deep-rooted that it becomes difficult to convince the clients - especially those over 40. It stands to reason... Their opinion is based on years of being subjected to the old harsh & flickering tubes from the '70s till the turn of the century. The much more recent PL & CFL lights don't suffer from the same stigma (at least not to such an extent) even though they use similar technology. Excellent article. Lighting accounts for considerable energy in the energy mix. LEDs are the ultimate in saving energy in lighting. LED is durable and able to withstand vibration and shock. They are not normal on / off switch, which is good, such as the bathroom area. In addition, they at full brightness as soon as they turn, many of which are fully dimmable. A very long period the halogen lights ruled the market for lighting but in the recent decade the trend is changing towards the LED lights . Now people are aware towards their health and wealth both . Traditional lights have some disadvantages like more electricity consumption, less durability , non-fashionable and in other hand LED is just opposite . The above blog describe some good points about this change .